Designed and built in the UK the Solsonic Ultrasonic Soldering Iron offers the advantage of flux-less soldering of similar and dissimilar metals and materials in common use as well as previously difficult to solder materials such as aluminium, ceramics, glass and silicon’s used in microelectronic applications. The 40 kHz standard ultrasonic generator is housed in a strong metal case with a carrying handle for ease of portability. The ultrasonic generator is matched to the ultrasonic transducer in the iron handle to ensure optimum performance at all activity levels. The unit automatically maintains the set amplitude under normal changing load conditions. RS232 connectivity comes as standard on the Solsonic Iron for full remote control of the irons functions such as tip temperature and ultrasonic power levels. The RS232 function is ideal if the Solsonic iron is required to be used in a Cartesian robot or similar remote applications. The new model of the Solsonic ultrasonic soldering iron comes complete with a newly designed ergonomic, lightweight handle, which ensures that there is a minimum of strain on the operator during the soldering process. 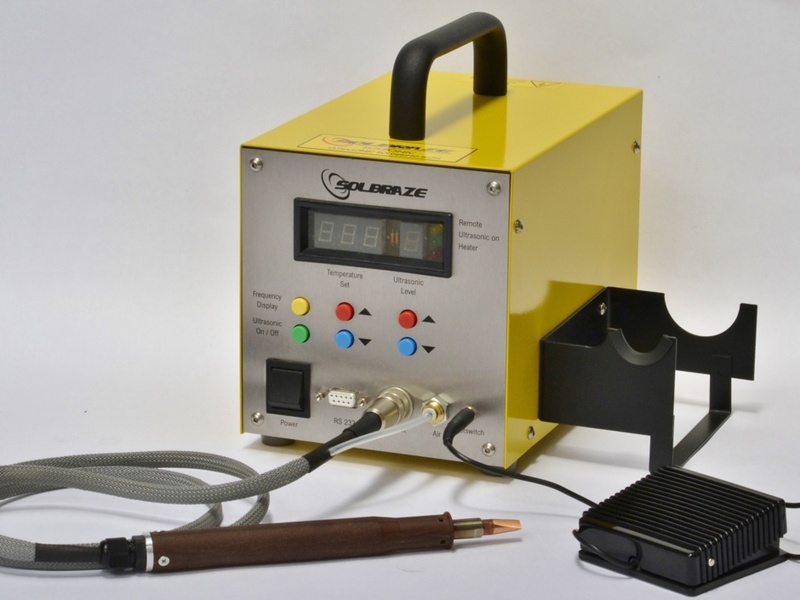 The Solsonic soldering iron incorporates a powerful heater, rated at 60W, and a digital temperature controller which allows the user to adjust the soldering tip temperature and provides control from 50°C up to 400°C ±2°C. The ultrasonic generator has 9 levels of ultrasonic activity, selected by push buttons, plus a function that allows the soldering iron to be used as a conventional soldering iron if required. The ultrasonic power is applied to the iron as needed by operating the provided footswitch or, alternatively, the power can be turned on and off using the button on the front of the unit. An ultrasonic transducer is built into the soldering iron handle and to prevent this unit being overheated a continuous use of a cooling air is required. There is a safety system in place to ensure that if the air pressure has dropped and has stopped cooling the transducer the unit automatically turns off to prevent frequency drift and damage to the transducer. The cooling air supply can be provided by a small pump, not supplied, or from a facilities own 0.75-1bar clean air supply. The iron comes with 3 interchangeable soldering tips, made from a high density hard copper, which have been matched to the ultrasonic generator to provide optimum performance. There are a variety of tips to choose from including various sizes of chisel, cone and point shapes from a range that Solbraze manufacture to suit the customers application. The Solsonic iron can be used worldwide as the ultrasonic irons power supply input can be switched to be either 110v or 230v depending on the local mains supply using a switch on the rear of the unit. No post cleaning of flux residues. No voids in joints due to ultrasonic activity. No wicking of solder into joints and wires. Stronger non-porous bonds as solder is forced into the surface layer of the material. The unit operates worldwide due to dual voltage selection. Joining anodised or plain aluminium, stainless steel and other materials such as niobium and ceramics. Suitable for surface lining glass. Used for filling blowholes in aluminium and magnesium castings.